We arrived in Tahiti at midday today, after an overnight sail from Rangiroa. It is a 200 mile hop from the Tuamotu islands to the Society islands. We left Rangiroa at 10am yesterday and the wind was 15-20 knots throughout (with the odd squall of 30-35 knots) which meant Anastasia could complete the passage in just one day. That was fortunate because the sea was a bit lumpy (even for a catamaran) and we would not have liked to be spending two nights bumping around. 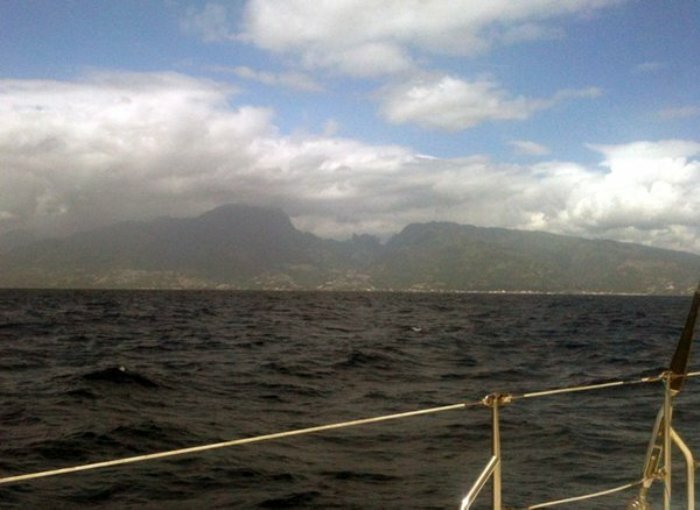 We are now berthed in Taina Marina, just outside the center of Papeete. Docking was a bit of a squeeze because Anastasia is rather broad in the beam (quite literally) and we had to snuggle into a gap between two monohulls (Piligrim and Zoe) but we are now safely moored up. Peter and Jane (off Trompeta) greeted us on the quayside and invited us to dinner, where Peter barbecued the last of the Wahoo they had caught on the trip from the Marquesas. Trompeta is due to be hauled out to have a skeg problem fixed, which means they are having to work through their stock of frozen fish before the freezer has to be turned off, so it was a good excuse to eat the fish. Very tasty it was too. We will have to think about how to make Jezebel more attractive to Wahoo (although we would not want her to be any less attractive to tuna, mahi mahi and marlin). Tahiti was a bit misty as we approached, but here is a photo of Papeete through the mist.